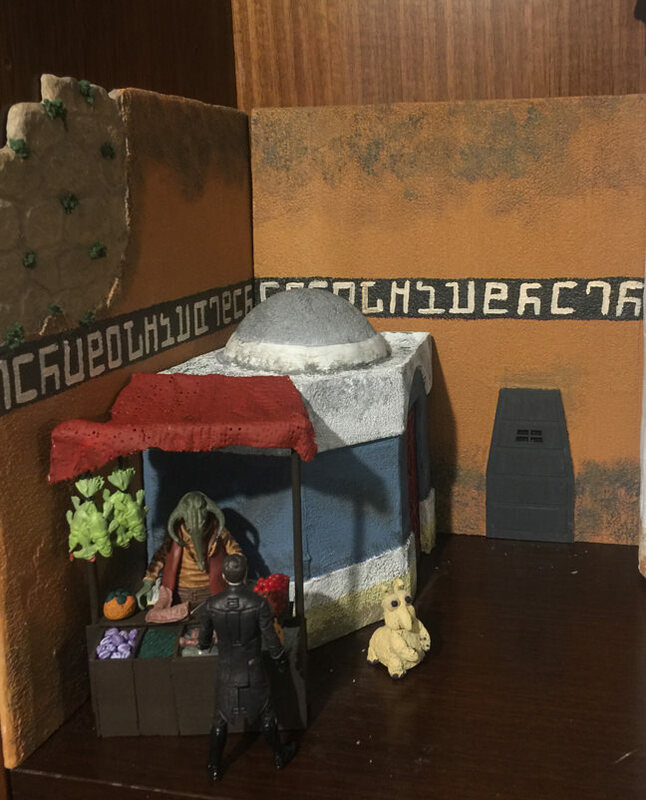 So, this project began as a simple attempt to build a photo backdrop for some custom figures, but as I researched building techniques, I got inspired and the project turned into something much, much bigger. 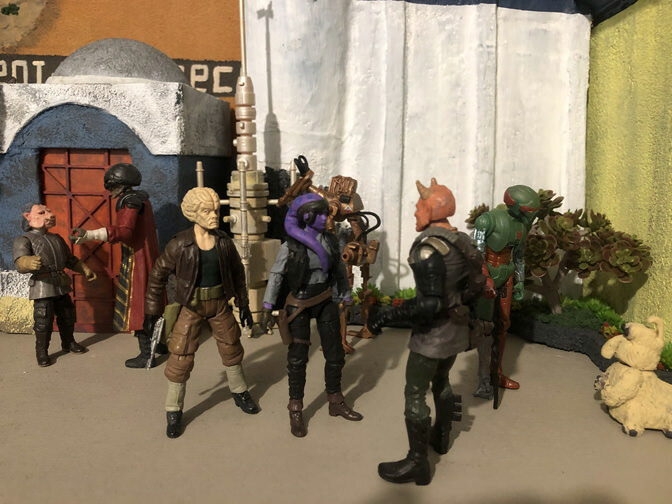 I decided I wanted an entire street scene to show off those customs, and since the figures weren't based on anything actually in the movies, I didn't want the diorama to be either. I wanted a generic spaceport inspired by the ones seen in the movies. As it turns out, Disney is building something exactly like that with their new Star Wars-land (sorry, "Galaxy's Edge"), so I decided to base my scene on some of their concept art. 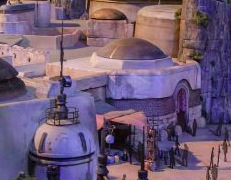 So here's the beginning of Black Spire Outpost on the planet Batuu. This is eventually going to fill a 12"x36" shelf in my bookcase, and besides this first building will also include a docking bay, shop, common area with landscaping, and possibly more if I can fit it in. 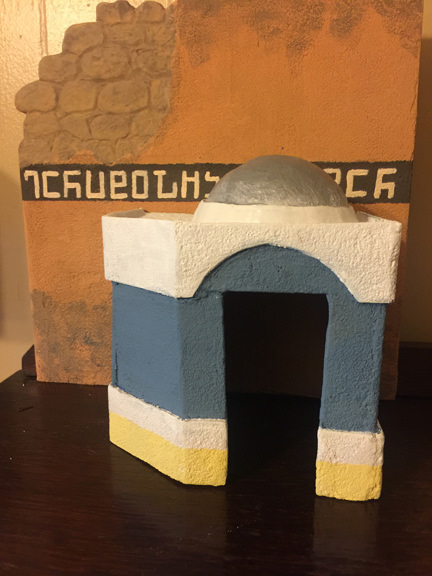 I started by framing the building out of cardboard and styrofoam. 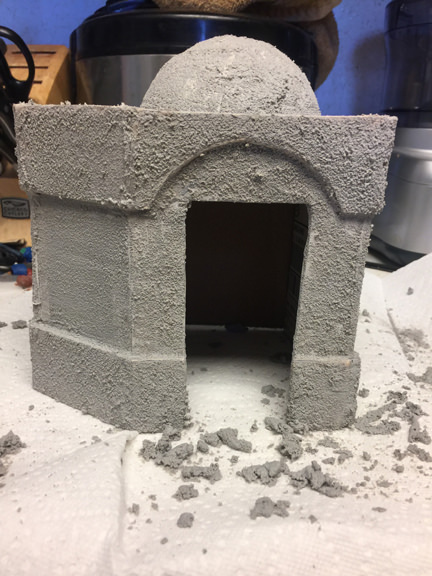 I'm going to need walls to hide the sides of the bookcase, so I went ahead and started making an ancient crumbling wall by carving some rocks in a sheet of wood with a dremel. 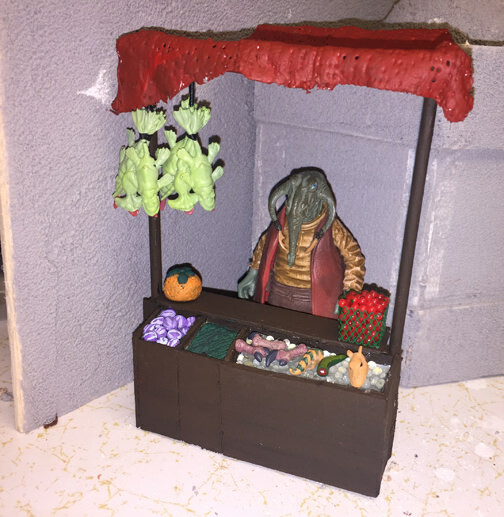 While I was waiting on the concrete patch to dry so I could sand and paint it, I built a food vendor's stall to attach to the side. It's balsa-wood and bamboo skewers with a canopy made from plaster bandage. 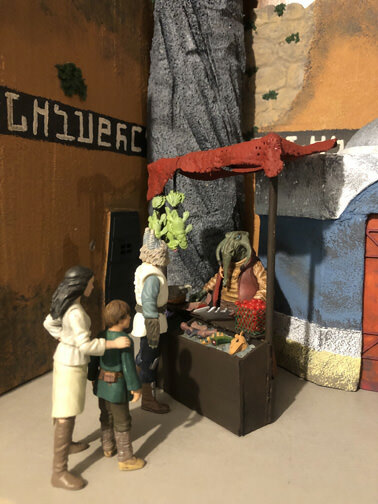 The hanging fish came from two Gragra figures, the other meats include claws from Dice Ibegon, the head and tail of a comic pack ysalamiri, and a tail from an Indiana Jones snake. The crate of red fruits is a miniature I found at the craft store, and everything else is modeling clay. And here it all is finished and in place on the shelf, along with a second wall that I didn't take any progress pictures of. 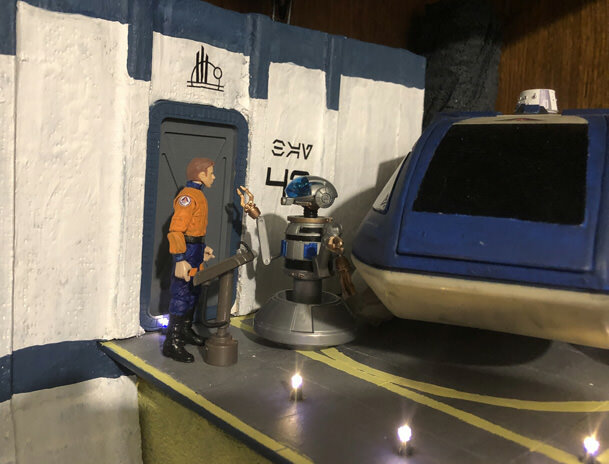 The door on the house isn't very visible in this picture, but it's one of Raylen's spaceport doors, and the one on the wall is one of his dungeon doors. Anybody recognize the little beige alien making a guest appearance here? There's more to come. I'll probably start working on the shop next. Wow. 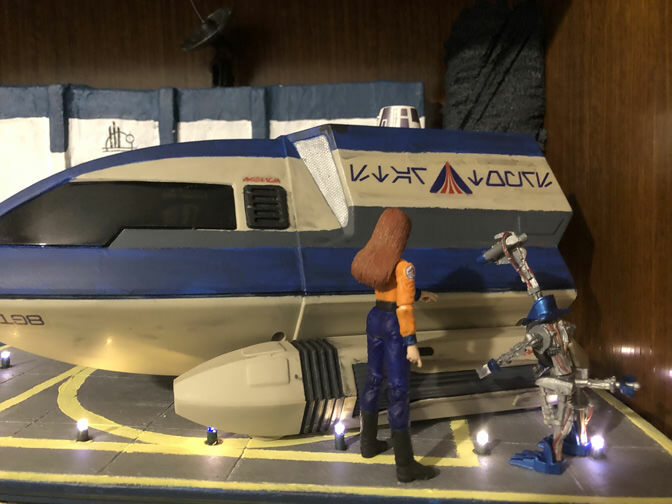 Fantastic looking diorama so far. I like the vendor stall. Very creative on what you used for "meat". SENSATIONAL! Keep up the phenomenal work!!! you're off to an outstanding start. This is awesome! Thanks for sharing and please keep us updated with your progress! Oh and what is the little yellow alien? That looks great so far. As to the alien, I'm in a Diz about it and want some peanut butter. I'm not sure why. So that's it for shelf one. 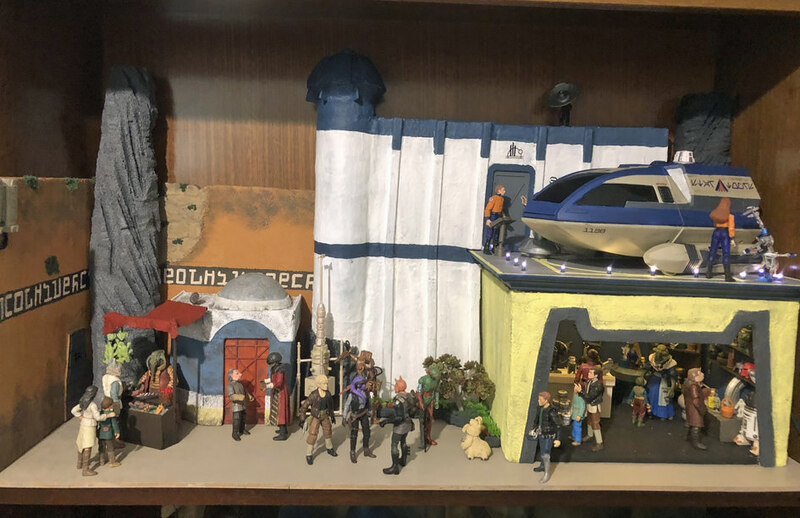 Next I'll probably build the cantina, which is going to be the centerpiece of shelf two. Love it! So many wonderful details!! shelf. Soon you will want an entire bookcase! I like the garden area asthat is something that is often overlooked in a dio. 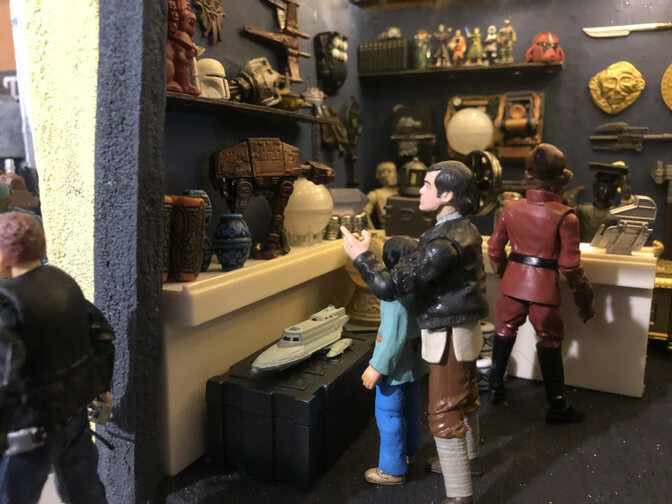 Figures collecting figures!! Shut me down! Absolutely wonderful and immersive set of photos. I'm sure there may have been a few tears but I'll bet you had a lot of fun putting this all together. Makes me wish we did our Ultimate Group Project version of this. When you wish upon a star, your dreams come true but because of the distance, not for a million years. This message is brought to you by Wookiee Cookiees - "MMM... Chewie!" This is everything I love about the hobby. Awesome work, can't wait to see this evolve. I wonder, will your version of "Black Spire" be finished before Disney's? 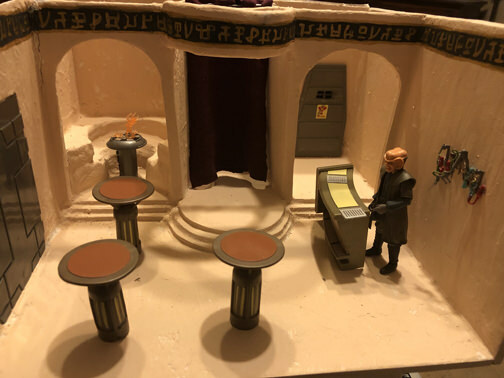 I still want to paint a little grime on the floor and walls, and add some more pipes to the drink dispenser and some cushions to the dejarik alcove seats. 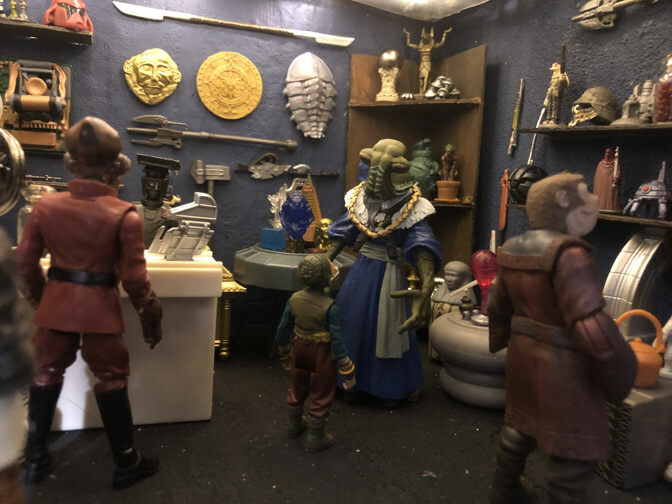 Once I get the bar fully installed, I may put in some of the bar stools from the cantina multi-packs if there's enough room. 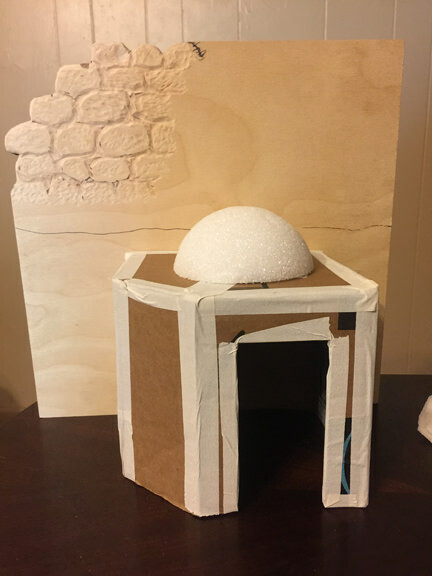 I'm also going to be building a roof with built in lighting, because the shelf this will be on is a little more in shadow than the other one and I don't want the alcoves to be totally dark. Very inspiring! Makes me want to get back into gear with some of my own projects.